Some people have asked me ‘what’ I am. Have you ever had that question? It can be asked around religion, spirituality, job title, culture…so much can land under that question. I find that amusing because there was a time when finding my label, my ‘thing’ was super important to me. I thought that knowing the correct answer would not only bring me clarity but would support me in creating Step Into Brilliance and even my own personal best life. I thought if it could just figure that out, my life purpose, my path would be open fully. The truth is I still don’t know how to answer it really. I don’t feel the need to limit myself to one ideal and defend it as ‘right’. I don’t even feel the need to answer the question anymore despite the funny looks and demands for clarification. And yet, here I am still walking my path and finding my truth and building an amazing life that I really love for myself. My need for labels and being pigeon-holed has diminished greatly. While I think they can be helpful in terms of getting what you need, or explaining things for your own personal spiritual practice, I don’t often bother with them. I have a theory you see. I share this with my clients in a metaphor that seems to reach just about everyone. It has allowed me to let go of my need to find one place that I can sit in and instead allows me to receive the blessings and lessons from anyone and everyone much more easily. We are all heading to the same place…the craving we have for connection to Source and enlightenment is there in all cultures, societies and spiritual or religious practices. Now think of that space as the top of a very high mountain. So, in this way we are all working towards getting closer to the summit. The kicker is – we do not all start off in the same place on the mountain and so could never (of course) take the same path. Some start out at the base, some a little higher. Some on the east side, some on the west. There are those who might have skills that they have shown up with which assist them, and those who are here to learn. 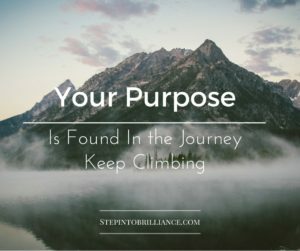 Some of us climb slower, get stuck or injured, cross paths and might walk awhile with another, or even just simply get lost and take some time to get back to our own journey up the mountain. And this is perfect. Otherwise we’d all be crammed into a tiny area, with the same exact view and experiences and learn nothing. NOTHING. How boring, crowded and useless would that be? Perhaps your culture, religion, spiritual practice or simply where you started can help you get a jump-start on your journey, or it might be the reason you got lost in the first place. It doesn’t really matter. What matters is that we understand that MY path is not the one YOU need, and yours will not be the one I need to find my way – even though we can learn and get inspired about how to climb from each other. We might even share a space, cross paths or even walk side by side for a time. The only ‘right’ way to climb this mountain is the way that feels right to you. There are those who will happily scale sheer cliff walls, those who need a gentle slope so they might learn to appreciate the view, and some (like most of us I suspect) who will encounter many different types of terrain in their journey. Will each of us reach the summit? I think so, although perhaps not in one/this lifetime. Source is waiting for us, wanting to help us. Most often I have found we over think the climb, let our fears keep us stalled and get too busy up worrying about doing what everyone else is doing. This is when and how we tend to get in our own damn way! This ideal of diversity and difference being wonderful is the ideal I hold for the life I personally lead. It’s helped a number of people in my coaching groups come to a place of peace with holding differences of beliefs from those they love. I’ve had this belief for a long time. What I’m noticing these days is there more folks realizing the higher elevations. And I often find tears showing up when I see them turning back to leave sign posts, markers and help lift others up. There is more and more raising vibrations, kicking aside our fear and choosing differently. This is personal power, and it’s amazing. It’s beautiful, and a lot less lonely at the top than our fears (and other people’s) would lead us to believe. Keep climbing. Where are you on this climb of a lifetime? P.S. Have you become part of the Step Into Brilliance community yet?